The Alaska Federation of Native’s theme this year, “Strength in Unity: Leadership — Partnerships — Social Justice,” takes shape as the largest gathering of indigenous people in the United States meet in Anchorage Oct 19-21. Sgt. Jody Potts, the director of Public Safety for the Tanana Chiefs Conference, and Lt. Col. Wayne Don of the Alaska Army National Guard came to leadership roles and social justice issues on broad stages. AFN opens on their addresses at 9:30 a.m. Oct. 19. Potts recalls an image of herself at age four or five running in 30 degrees below zero behind her father and brother in the woods of Eagle where she was raised. The foot race encompassed a mile in upper Yukon River territory between a relative’s cabin and their own. Potts is Hans Gwich’in, though Eagle was no traditional Alaska Native village, given its long history as an 1800s trading post and center for gold rush activities. Her own long list of accomplishments began in lessons her dad taught her — through running, trapping, hunting — that she can do anything if she sets her sights on it. After graduating from Glennallen High School in 1995, Potts was crowned Miss National Congress of American Indians in 1998. A year later, in 1999, she was named Doyon Youth Shareholder of the Year. Adeline and Mike Potts, Jody’s parents, lived a subsistence lifestyle following a trapline in winter, supplemented by Mike’s work building log cabins. Her mother baked bread and pies, and lived a community-minded philosophy. Working out and running was a regular part of life under the accomplishments of her fitness-minded dad and brothers in the village of Eagle. Back then, on the southern banks of the Yukon River near the Canadian border, Eagle had a small population of about 100 people, most of them Caucasian. “It helped develop my character, my sense of belonging in the community. At the same time, there were a lot of alcohol related problems and I definitely saw some of that. It’s a part of what made me adverse to alcohol and drugs in a way that I’ve been lucky to not struggle with addiction. I saw so much negativity resulting from it,” she said. Presenting a positive role model for other women was one of her tasks while serving as the Miss National Congress of American Indians. NCAI is an organization that protects indigenous treaty rights, works on policy issues and advocacy, so this was not just a beauty contest. “To hold the title was a real honor,” Potts said. “It was a lot of great experiences as a role model for young native girls. I traveled throughout Indian country, the Lower 48 and Alaska, and spoke to Tribes, to students at universities in Native programs and went to Washington, D.C.
A scholarship came with the award. Potts also married and had three children: Izzy, 17, Quannah, 15 and Denali, 12. To her, parenting became her most important role but she wanted to make other contributions as well. She graduated from Northern Arizona University with a bachelor’s degree in applied indigenous studies in 2008. After earning her degree, Potts returned to the Glennallen area in 2009 and began her job hunt. She considered a Tribal position in administration, wanting to make contributions through indigenous social issues. Then, spotted training for Ironman triathlon races and noticed for her strength, she was invited to enter law enforcement. Alaska State Trooper Sgt. Dwayne Stone, recruited her. “I had been running and cycling, and was asked if I had ever considered law enforcement,” she said. In addition to training at the Alaska State Trooper Academy, Stone mentored Potts throughout, showing her how to work with victims and suspects, and important traits such as respecting people where they are at in life, she said. It was a role that fit and put Potts’ skills to work. As a new VPSO she was assigned to the village of Tazlina. Three years later she was appointed head of the organization in 2013, overseeing a territory that is the third of the state of Alaska and encompasses 42 villages. It’s also stress management, she said, to offset law enforcement work. To even do one triathlon takes countless hours of training: her most recent completed event was 2.4 miles swimming, 112 miles biking and a marathon run of 26.2 miles. Invited to be a speaker for AFN is another honor recognizing Potts for her years of dedication. Now Potts has returned full circle to her subsistence lifestyle as well, only now she’s putting caribou, moose and grouse on the table. Her roles are somewhat uncommon to women as she works, competes and recreates in what is considered a predominantly male domain. Wayne Don grew up in the 1970s on Nunivak Island surrounded by the Bering Sea with his two brothers, parents Fred and Annie Don, and a large extended family. One of the first televisions on the island was in his parent’s home, which meant people gathered there to see the new source of entertainment. Books were in his family’s home. Don’s mom had graduated 8th grade and wanted to attend Mt. Edgecumbe High. Like Potts, Don was a runner and athletic, living a subsistence lifestyle. One summer while commercial fishing out of his mother’s village of Quinhagak near the Kuskokwim River at the age of 14, he had an epiphany about what he wanted for his own goals. “I realized I wanted to go to college,” he said. Don was accepted into the Rural Alaska Honors Institute his senior year, a college prep program that students had to apply to enter. After graduating Mekoryuk High School in 1990, he immediately attended the University of Alaska Fairbanks thinking of studying criminal justice to either be an Alaska State Trooper or go to law school. He considered dropping out to join the Army. Instead, he stayed in college and joined the Army. For initial training, he was shipped to Fort Leonard Wood, Mo. Then, back at UAF, he joined the ROTC as a cadet. When he graduated in 1994 from UAF with a degree in criminal justice, his life in the military continued. Army routines and traditions appealed to him, he said, the physical training aspects and warrior culture. “It gave me a sense of purpose,” he said. A year after graduating, he was sent to Bosnia. “I recall my dad’s ritual each evening was watching the national news on television,” he said. The war in faraway Bosnia dominated the screen in the late 1980s, the drawn out conflict involving Bosnians, Serbians and Croatians. Eight years later, 2nd Lt. Wayne Don was poised to cross the Herzegovina River into Bosnia. The U.S. had negotiated the Dayton Peace Accord and Don was one of the peacekeeper troops sent in on a one-year mission. At 23, he felt in over his head, but Company Commander Lee Rysewyk (now in Washington, D.C.) told his most junior lieutenant he would be in charge of crossing the river, leading 30 troops. “My heart absolutely sank,” Don recalled. “I was scared. I was unsure. At this point, I was questioning his judgment. But he was the most combat-seasoned company commander the Army at the time,” after serving in Somalia and during Desert Storm. Rysewyk’s confidence and faith changed a dynamic in Don’s own belief in his capability. He passed that leadership test, getting his men across without incident. His troops were there that year, and a second mission, to support local governments as they were being stood back up. “What I saw in the country and the privations of people, it makes you proud to be who you are, privileged to live in a country that has organizations and beliefs that protect us from large scale violence like that,” he said. 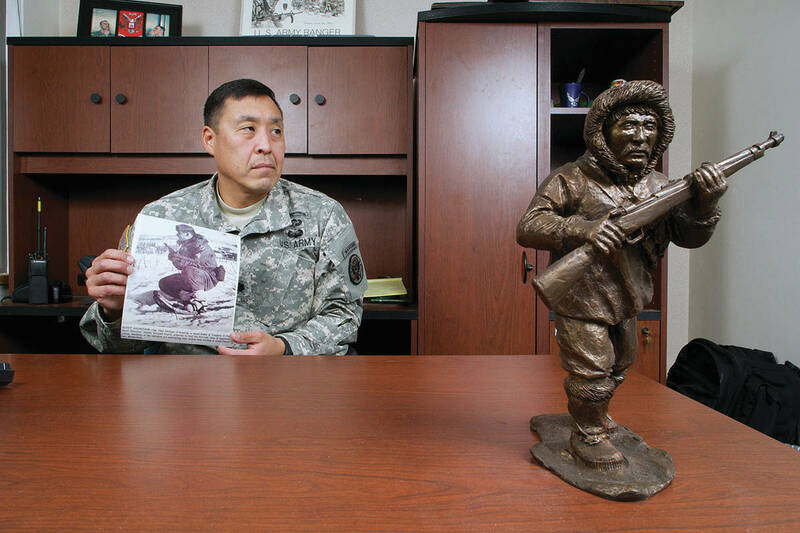 In 2001, Don returned on an assignment to teach ROTC at UAF, and completed a master’s degree in business while there. The Sept. 11, 2001, terrorism attacks on the World Trade Center and the Pentagon occurred while he was in Fairbanks, an event that made him feel he should be serving his country. At the end of four years at UAF, he joined the Alaska Army National Guard in 2005 and was sent on two subsequent missions to Afghanistan. In 2011, he was honored with the prestigious Marshall Memorial Fellowship, an award that gave him an intense 23-day journey through five European countries meeting with world leaders. French President Emmanuel Macron is alumni of the same leadership program, for example, which invites emerging leaders from the U.S. and Europe ages 28 to 40 to explore each other’s politics, business, innovation, and culture through experiential learning. Don visited Romania, Belgium, Germany, Macedonia and Italy. That was a profound time of learning on a broad stage, Don said and exposed him to a range of political and leadership issues. Soon he would be putting those insights to work for his own people. He was elected to the Calista Corp. board of directors, and serves as chairman on his village corporation, Nunivak Island Mekoryuk Alaska or NIMA. He also continues to work for the Alaska Army National Guard after being promoted from major to lieutenant colonel in 2013. For most, it takes years to achieve that level, but Don reached it at the age of 41. Of all his honors, coming back to Alaska, taking on leadership roles at Calista and NIMA hit Don as being meaningful in a deeply personal way. Selected for the keynote address before the AFN means a lot to him, he said, and he credits the AFN as being a factor helping him become a leader today.